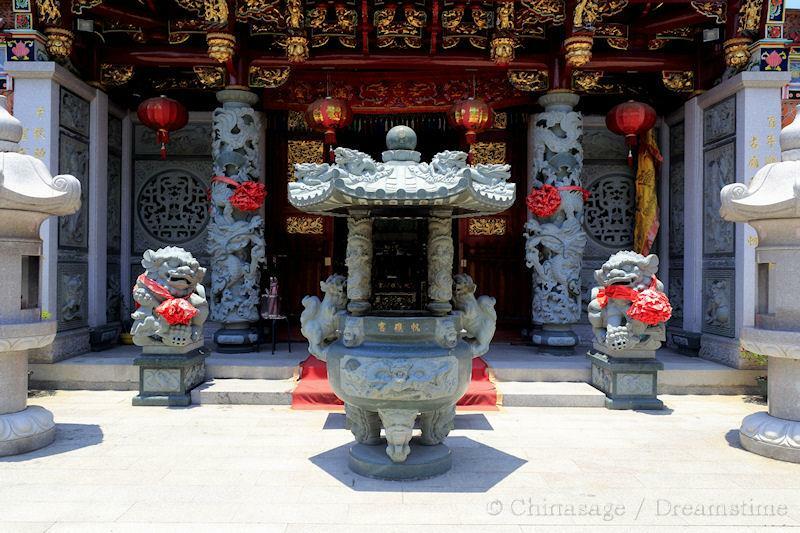 Daoism is one of the main 'religions' of China. [You will often see this is as ‘Tao’, ‘Taoism’ using the older Wade-Giles spelling of Chinese, Dao is the modern pinyin spelling]. Dào 道 means roughly the Way and the name reflects its chief principle, finding the correct path through life. However it is more dynamic than just a fixed path, it adapts and changes always seeking an equitable balance. There are three main aspects of Daoism: philosophy; meditation and folk religion. The philosophy is best known in the West through the book of aphorisms called the 'Dao De Jing' Tao Te Ching ➚ which can be very roughly translated as the 'Virtuous Way'. The philosophy seeks to find a balance of a person with the world, and is more concerned with self contemplation than with relationships by contrast to Confucianism. The more substantial later work is the Zhuangzi ➚ (or Chuang Tzu) with many philosophical thoughts; paradoxes; jokes and riddles. It seeks the virtuous way that people should follow. Politics and purely logical thought are rejected as pointless as they do not lead to harmony and peace. As Daoism incorporates the contemplative study of nature, it is from the Daoist strand of Chinese philosophy that scientific inquiry developed. Many Daoist scientists made important discoveries; some as alchemists seeking the elixir of Immortal Life who as a by product contributed to chemistry and physics. The Han Emperor Wudi's quest for immortality stimulated the investigation of various legends concerning the Yellow Emperor. Where Confucianism seeks to put people in their proper place in society, Daoism puts people in the proper place in the world. 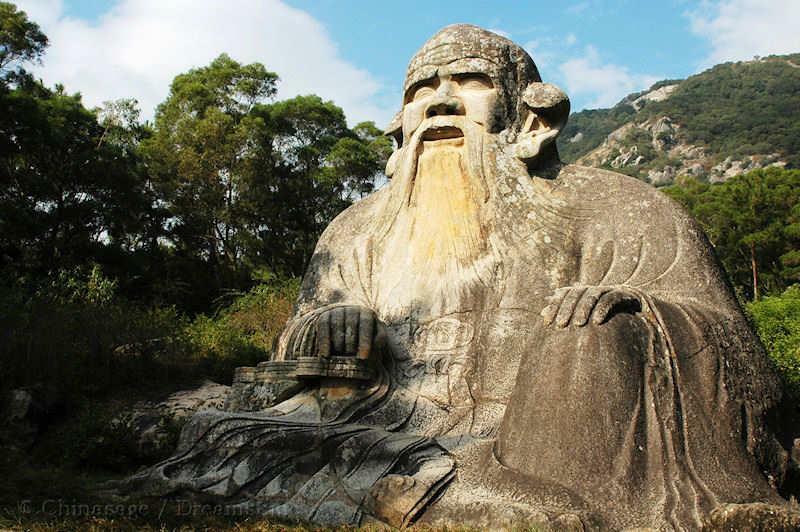 Lao Zi is the semi-legendary founder of Daoism, from about the same time as Confucius in the Warring States Period (6th century BCE or may be 5th/4th century BCE). The philosophy was refined by Zhuang Zi (399-295BCE). Daoism was popular during the Tang dynasty, particularly as it promised long life, if not immortality, for those that followed its tenets. Development was stimulated by rivalry with Buddhism with which it shares a number of core beliefs. In popular culture Daoism with its pantheon of minor gods and spirits, as everything is regarded as having a spirit, offers a good excuse to hold festivals. For centuries Daoism was considered the religion of the ordinary people while Confucianism was the religion of the ruling elite. The folk religion strand of Daoism has even older roots as it grew out of ancient beliefs in spirits and mediums when sorcerers and mediums possessed the power to appease angry local spirits. Somewhere in the range of thousands of deities will be one who may respond to offerings with the required good luck; money; rain or healing that the petitioner needs. This has echoes with the pantheon ➚ of Greek and Roman gods; goddesses and other spirits. Daoism is closely related to Feng Shui, which is concerned with the harmonious arrangement of people within the environment and Taijiquan emphasizing the strengthening the life force or ‘Qi’. It is in Daoism that people seek the balance between the opposing forces of Yin and Yang. In reaction to the coming of Buddhism to China at the end of the Han dynasty, Daoism became more systematic and to counter the Buddhist belief in re-incarnation, the quest for immortality became the goal. During the Jin dynasty some Daoists reached high positions in government and formed a group known as the Seven Sages of the Bamboo Grove ➚. Emphasis on introspection and self-knowledge gave Daoists the ability to think independently of the main stream; many Daoist philosophers would live as hermits cut off from civilization. Over the centuries, rebellions were started by Daoists that went on to overthrow the ruling dynasty; movements such as the Yellow Turbans grew from the rejection of worldly values and brought an end to the Han dynasty. During much of Chinese history, particularly when Confucianism was the leading doctrine at the Imperial Court, Daoism was despised by most scholars and treated as pure flummery for the uneducated. Because the study of nature and therefore science was associated with Daoism, periods of official rejection led to the neglect of scientific study. Daoism was the doctrine for the countryside and nature; Confucianism for the city and people. An exiled official sent into the countryside would often turn to Daoism for solace. Later on, the Daoist religion became formally acknowledged, the Emperor confirmed a Daoist leader as the official authority of the religion - he was called the 兲师 Tiān shī 'Master of Heaven'. This official position lasted from the 4th to the 20th century in south western China. It was Daoists who resisted the building of dams; railways and any constructions that affected the environment, disrupting the natural feng shui. However the belief was not for the benefit of the environment and wildlife itself, only so far as the environment would fit in with human purposes. So there is no Daoist objection to destroying nature reserves per se, only if the destruction would adversely affect people. In recent years Daoism has had a resurgence. Westerners have taken to reading and appreciating the Dao De Jing. The Daoist wish to live in harmony with nature has widespread appeal now that environmentalism has become mainstream. Many people turn to Feng Shui practitioners to arrange and design their homes and gardens; for example the veteran cricketer Geoffrey Boycott ➚ is a firm believer in Feng shui ➚. Lao Zi is considered the founder of Daoism. Unlike Confucius details of his life are very sketchy; often based on myths and legends. His name just means ‘Old (or Venerable) Master’. He is believed to be the author of the Daoist classic ‘Dao De Jing’, but this is contested by many experts. The text has been assessed as being written no later than the 2nd century BCE but could be based on a far older text. Lao Zi probably lived in the sixth or possibly the fourth century BCE. According to one tradition he was born in Henan 604BCE into a distinguished family. He may have served as an archivist at the Imperial capital at Luoyang before returning as a hermit to his native village. Tradition has it that Confucius visited Lao Zi for instruction but this story is likely to have been invented to advocate the superiority of Daoism by an imagined encounter. Buddhism has some overlapping core values and beliefs with Daoism, so when Buddhism arrived in China the Daoists hit back by suggesting that Lao Zi had fled from China and founded Buddhism in India. He is often portrayed as an old man seated on a water buffalo while on a journey to the West. Legends have grown up about his life over the intervening 2,600 years. Some say he was conceived by a beam of light and that he was born already with white hair. It is appropriate that Lao Zi is associated with longevity and immortality. Later Daoists have attributed their own works to him, partly as a homage and also to promote their writings. All this makes it difficult to disentangle Laozi's personal contribution to Daoism. 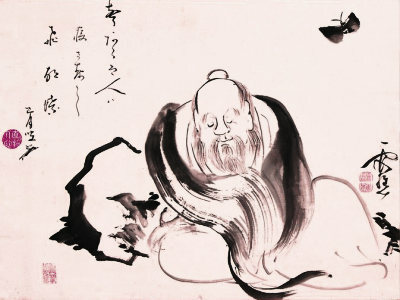 Zhuangzi dreaming of a butterfly (or a butterfly dreaming of Zhuangzi). Image from this page ➚. Image available under a Creative Commons license ➚. Just as Mengzi (Mencius) promoted the Confucian philosophy of Kongzi (Confucius) it was Zhuangzi who refined and promoted the Daoist philosophic tradition of Laozi. He is also known by his family name of Zhuang Zhou (Chuang Chou WG) (the 'zi' means master and is an honorific). Details of his life are fragmentary, the great historian Sima Qian could only vaguely suggest where he was born in Anhui or Henan and describe a few key moments in his life. He was known as a very erudite and persuasive speaker; but he turned down an official position at court, choosing instead to live modestly. However, he did not live the ascetic lonely life of a hermit, he married and had a family. He is famous for teaching of the relativism of all things and the unattainability of absolute truth. It was Zhuangzi who postulated that while he was dreaming that he was a butterfly, he might actually have been a butterfly dreaming himself a man ➚. Over the centuries many tales have woven around him. Some Daoists consider him a god and have given the planet Jupiter as his realm. His main work is the ‘The book of Zhuangzi’; which is considered a masterpiece of Chinese literature. It is a longer and more insightful book than the Dao De Jing. It is set out as a series of stories that recount riddles and paradoxes. They are intended to give pause for thought and contemplation, a mission they have most ably served through the centuries. Over the first few centuries other tales were added to the book by various authors as an anonymous homage. As they are written in his style it has proven impossible to work out exact authorship. The text stabilized under the editorship of Guo Xiang ➚ who died 312CE. ‘Doing nothing’ seems a rather odd philosophical principle and yet Daoism does indeed promote 无为 wú wéi - literally ‘not to do’. To give a taste for Daoist philosophy this section explores this idea in detail. Like many Daoist tenets there is a paradox embedded in the idea of inaction. It is not intended that nobody does anything, it is more like doing nothing that is not natural to do. A closer translation is probably ‘non intervention’ as ‘wei’ has the meaning of action with a purpose - an act of conscious will with some motive behind it. It's an attractive notion. In an ideal world governments would paradoxically govern by inaction. This is because everyone would know what to do - they just get on with it - there is no need for anyone to intervene. A boss does not need to goad people into useful work, it all happens naturally. This approach to government was tried out by the Qi Kingdom (Shandong) c. 190BCE and later by Emperor Wu of the Han dynasty (141-87BCE). Living like this in social harmony is a rather Utopian ➚ concept. Like many Daoist beliefs it is rooted in the natural world. Nature was seen as being able to get along quite nicely without being managed - plants intrinsically knows how to flourish and water how to flow. The calls to ‘do nothing but what comes naturally’ was contrary to the Confucian attitude of striving to perfection where effort must be expended to do the right thing. However Confucius does promote the idea of the ruler not needing to do anything because a well governed state will respect the sovereign’s wishes without him needing to do or say anything. Here subservience and respect ensures the government runs well. To the Daoist, however, wu wei is an individualist notion - not as a cog in a larger machine. Over the centuries Confucians have sought to change the interpretation of wu wei from meaning ‘doing nothing’ to ‘knowing one's place and obeying without question’. Harmony, health and contentment must be put above attempts of the government to manipulate the people into pointless efforts and worries. But the concept of ‘wu wei’ is at the heart of the inwards contemplation and letting nature take its course. The notion of release from the slavery of desire in evident in chapter 37 and this is also central to Buddhism. Walking on Path in Spring by Ma Yuan 马远 c.1190 - 1279, a Chinese painter of the Song Dynasty. Image by National Palace Museum ➚ available under a Creative Commons License ➚. 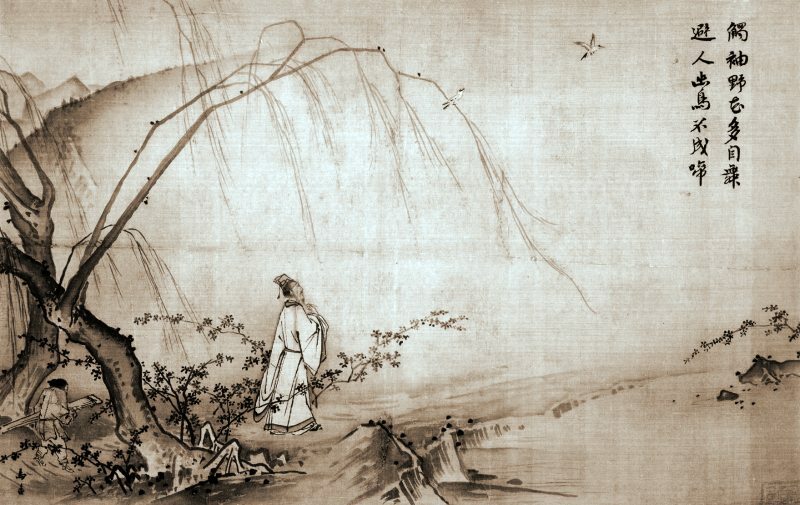 The image of a solitary sage walking alone among the mountains is a very common Daoist theme. 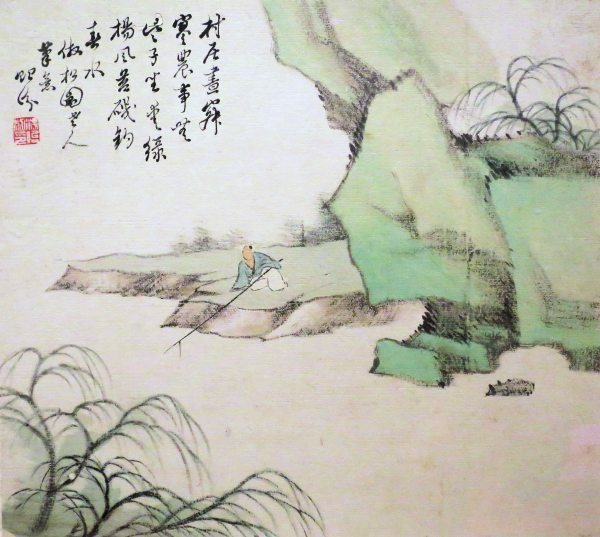 Here the sage leaves behind the world (trees and a servant carrying a guqin) along a path that leads to nothing but mist, exploring the unknown and unseen. In chapter 43 a frequent Daoist analogy of the ability of water to abrade and penetrate even the hardest rock with no apparent effort. “The softest of things can dash itself against stone and yet overcome even the hardest. Water can penetrate rock through tiny crevices. Chapter 48 distinguishes knowledge from wisdom - understanding from pure facts. “Devotion to book learning increases knowledge, devotion to the Dao diminishes action. Acting less and less leads to inaction but then there is nothing that can not be done. The paradox of achieving things by doing nothing is again explored in chapter 64 where acting early when problems are still small, or else gradually starting a major undertaking gives the idea of effortless effort - great things are achieved with barely any action. It is the origin of one of the most quoted Chinese proverbs ‘A journey of a thousand miles begins with a single step’. “In times of calm it is easy to prevent calamity. Brittle things are easily broken and small things lost. Action is needed before disorder takes hold. A tree that is too broad to clasp began from a tiny seedling; a tower of nine floors began from a small mound of earth; an epic journey begins with a single step. Acting with intent does harm; clutching something loses control of it. The sage does not act in this way. It is just as important to properly finish as to begin in order to avoid ruin. This can be thought of as a move towards empathic thinking. Things will get along just fine if we take the time to first fully understand the situation. Here there is a some metaphysics behind the notion. ‘Virtue’ and ‘good intentions’ are abstract notions that are not in themselves active and yet achieving them as intrinsic qualities allows great things to be achieved. Daoists do not believe in a divine essence actively controlling the world or that people are naturally wholly good. Instead it is a call to trust in their better natures rather than rely on imposed orders. It can also be interpreted as discouraging adventure and becoming inwardly content with one's lot. The time that the Dao de Jing was written is a subject of hot debate. The consensus seems to be that it was put together in the Han dynasty (206BCE - 220CE) from a collection of earlier fragments but long after the semi-legendary ‘author’ Laozi may have lived. It was in the Han dynasty that the Daoist canon was refined and the concept of ‘wuwei’ has somewhat changed over the centuries. “Non-action does not mean doing nothing and keeping silent. Here the enlightened man (sage) does indeed intervene but to maintain the natural order when it is threatened. In order to do this inner harmony must first be achieved – to be at one with the spirit of things (the 气 Qì). All these views on ‘inaction’ and ‘non-intervention’ show the Daoist wish to cultivate a better self rather than waste effort on empty endeavors. The paradox of effortless effort is one that has been pondered upon by Daoist philosophers throughout the ages. * Our translation of the Dao De Jing is our own. This is in the spirit of Daoism as everyone has to find their own way (道 dào) - no-one's interpretation is any more correct than anyone else's. Hermitage in the Mountains, painting by T'ang I-fen (Tang Yifen), 1846, Honolulu Museum of Art, accession 7862.1, from album of 10 leaves. Image by Tang Yifen available under a Creative Commons License ➚. A solitary figure fishing in a river corresponds well with the Daoist wish for peaceful contemplation of nature. Citation information for this page : Chinasage, 'Daoist philosophy', last updated 7 Jan 2019, Web, http://www.chinasage.info/daoism.htm.